RITCHIE, WILLIAM BRUCE ALMON, lawyer and military officer; b. 27 June 1860 in Annapolis Royal, N.S., son of the Reverend James Johnston Ritchie and Eliza Almon; m. 14 June 1905 Lilian Constance Harriette Stewart, sister of Charles James Townshend Stewart, in Halifax, and they had two sons; d. 25 Dec. 1917 in Vancouver. 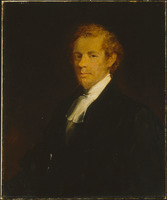 A member of the third generation of Nova Scotia’s best-known legal dynasty [see Thomas Ritchie*], W. B. A. Ritchie is significant for two main reasons. He represents a new form of legal professionalism, based on administrative forms of state service, involvement with business corporations, and legal education on the Harvard University model, which in the 1870s began to replace the old-style professionalism of the pre-responsible government era, centred on political office and English-style legal education. Two of Ritchie’s uncles, John William Ritchie* and Sir William Johnston Ritchie*, both judges, had held high political office, but not one of the 11 Ritchie lawyers of the subject’s generation did so. W. B. A. Ritchie is also an exemplar of the Maritime lawyers who in the 1890–1920 period migrated to the western provinces, where they soon rose to positions of power and influence. It was virtually inevitable that W. B. A. Ritchie would follow the law. His own father had been a barrister in Annapolis before taking holy orders. His only brother, James Johnston Jr, became a lawyer (he would be appointed a judge of the Supreme Court of Nova Scotia in 1912), and both his sisters married Annapolis lawyers. William began his articles in 1877 under local lawyer J. M. Owen and in 1880 assigned his final year to his brother, now practising in Halifax. He then spent 1881–82 at Harvard law school before being called to the bar on 5 June 1882. His brother had received a Harvard llb in 1877 and four Ritchie cousins had also studied there. Ritchie practised alone at Annapolis until 1886, when his brother returned from Halifax and they went into partnership. 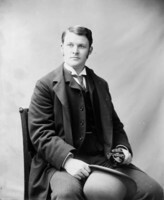 His reputation as a litigator was such that he was asked by Robert Laird Borden* to form the firm of Borden, Ritchie, Parker, and Chisholm in 1889 when Borden’s partner Wallace Nesbit Graham went to the bench. Ritchie was to share in the profits as a partner, while William Frederick Parker and Joseph Andrew Chisholm* remained on salary. Two new salaried associates were eventually taken on: Borden’s younger brother Henry Clifford (Hal) and Ritchie’s nephew Thomas Reginald Robertson. The three decades before World War I were boom years for lawyers in Halifax. A select group, including Borden, were active corporate investors and promoters as well as advisers, but Ritchie seems to have taken little part in the business side of corporate affairs. 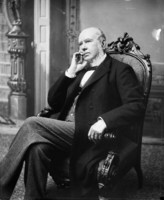 He and Borden were two of the most sought-after counsel in Nova Scotia appeals before the Supreme Court of Canada in the years 1890–1905, and Ritchie occasionally argued before the Judicial Committee of the Privy Council. He often represented the corporations whose legal business Borden secured for the firm, such as the Dominion Iron and Steel Company Limited, but preserved a degree of independence in selecting clients. Once he defended on appeal an agent of the United Mine Workers of America convicted under the Industrial Disputes Investigation Act (1907) of assisting Cape Breton strikers by buying them food. The conviction was affirmed in spite of his efforts. On occasion he appeared on the opposite side of a case from his brother, which speaks of the high degree of trust they both must have enjoyed in their clients’ eyes. Professional honours abounded: a qc (federal) in 1895, and the presidency of the Nova Scotia Barristers’ Society in 1905 and 1906. British Columbia would award him a kc in 1913. When almost 45 Ritchie married Lilian Stewart, who was 20 years his junior. Her legal antecedents were second only to his own: she was the granddaughter of Alexander Stewart*, Nova Scotia’s last master of the rolls, the niece of Charles James Townshend, chief justice of the province from 1907 to 1915, and connected as well to the Tupper family. Her father, a lawyer turned gentleman farmer who had “never in the course of nearly a century . . . done a day’s work,” is the eponymous subject of Charles Stewart Almon Ritchie’s collection My grandfather’s house (1987). Important changes in Ritchie’s professional life coincided with his change in civil status. 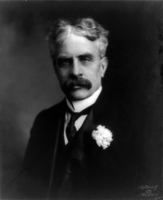 Borden left the firm in early 1905 because of increasing political involvements. Ritchie agreed to keep Hal, a recent widower with three small children, and made T. R. Robertson a partner at this time. In 1911 Ritchie took his family to Vancouver, where he joined the prominent firm of Bowser, Reid, and Wallbridge. Family tradition has it that money was a major factor in the move. The explosive growth of the British Columbia bar from 235 in 1905 to 488 in 1913 suggests that opportunities abounded. An extensive network of Maritime lawyers existed to assist Ritchie. Charles Hibbert Tupper*, briefly a partner in Borden and Ritchie’s firm in 1896–97, had left then to establish himself on the west coast. Fellow Conservative William John Bowser*, attorney general of British Columbia since 1907, was a New Brunswicker and Dalhousie law graduate (1890), and Robie Lewis Reid was a Nova Scotian. Borden probably assisted the relocation by facilitating Ritchie’s appointment as chief counsel for the immigration branch of the Department of the Interior at Vancouver. It was in this role that Ritchie was connected with the notorious Komagata Maru incident, which saw a shipload of 376 Punjabis, mainly Sikhs, barred from landing at Vancouver in May 1914. Ritchie’s duty was to defend the decision of the immigration agent, which he did successfully when it was challenged before the British Columbia Court of Appeal. There was little doubt that the exclusionary orders in council issued in 1908 had been drafted precisely to cover this kind of situation. The incident’s historian, Hugh Johnston, suggests that Ritchie conducted the defence in an entirely correct and professional manner. Upon the outbreak of war Ritchie, aged 54, wished to go overseas but was excluded because of partial deafness. He was offered the post of chief recruiting officer for the Maritimes, with the rank of major, and thus returned to Halifax in 1915. Back in Vancouver in 1917, he assisted his old friend Borden by campaigning in the Unionist cause that fall. He was also active in organizing Halifax relief in Vancouver after the explosion of 6 December. But his deafness was symptomatic of mastoiditis, which required surgery. Ritchie did not recover, and died on Christmas Day. Vancouver dispatches called him one of the best-known lawyers in Canada, and judge Robert Henry Graham remembered him as “the best all-round man of his day.” His young sons eventually rose to prominence in their chosen fields. Charles Stewart Almon was encouraged by Borden to enter the diplomatic service and has also achieved renown as a diarist. Roland Almon read law at the University of Oxford, practised in Halifax, and served on the Supreme Court of Canada from 1959 to 1984. BCARS, GR 1415, file 1917/4819. NA, MG 26, H: 40222, 109038, 118770. PANS, MG 100, 234, no.22a; RG 39, HX, M, 8, no.15; 11, no.13. Daily Colonist (Victoria), 27 Dec. 1917. Halifax Herald, 27 Dec. 1917. Morning Chronicle (Halifax), 27 Dec. 1917. Vancouver Daily Sun, 27 Dec. 1917. R. C. Brown, Robert Laird Borden, a biography (2v., Toronto, 1975–80), 1. Canada Supreme Court Reports (Ottawa), 1890–1917. Hugh Johnston, The voyage of the “Komagata Maru”: the Sikh challenge to Canada’s colour bar (Delhi, India, 1979; 2nd ed., Vancouver, 1989). Nova Scotia Reports (Halifax), 1884–1911. C. [S. A.] Ritchie, My grandfather’s house: scenes of childhood and youth (Toronto, 1987). M. C. Ritchie, “The beginnings of a Canadian family,” Nova Scotia Hist. Soc., Coll. (Halifax), 24 (1938): 135–54. Scholefield and Howay, British Columbia. Philip Girard, “RITCHIE, WILLIAM BRUCE ALMON,” in Dictionary of Canadian Biography, vol. 14, University of Toronto/Université Laval, 2003–, accessed April 20, 2019, http://www.biographi.ca/en/bio/ritchie_william_bruce_almon_14E.html.